Okay, I’m sure you’ve heard a million times… that you need a place to collect emails on your website. If you’re not collecting emails on your website, you’re missing out on a HUGE opportunity to build relationships and make sales easily. Now, you can’t just get something for nothing. That’s just not how the Universe works. There must be an equal exchange—otherwise no-one is going to sign up to your email list. Nor should they! Well, unless you give killer value! Make sure you have an incredible offer. This comes with an innate understanding of your audience. When people hit your site, and they are interested in the content you have to offer—you have an opportunity to continue building the relationship. When they have interest, that’s the time to show them a chance to download your amazing free offer in exchange for an email address. If they loved your content (and many will!) 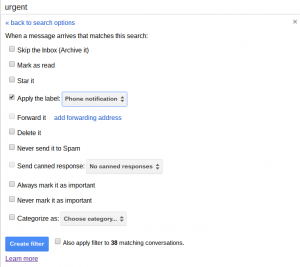 this gives you a chance to stay on their radar via email. They get your sweet download, and an opportunity to keep following you. 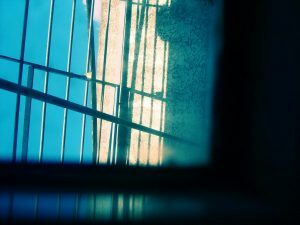 I will personally, often plug my email into the optin on the sidebar of blogs just so I’m updated. We’re all so busy now, I just might forget about them if I don’t sign up. The point is to capitalize on the interest when you have an opportunity. The opportunity is present the moment someone hits your website and makes a decision of whether or not they like you. The real value here, is that you can continue to build a relationship with your audience over email. 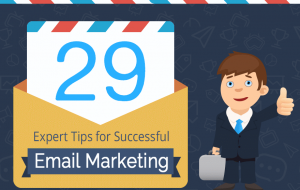 There are lots of ways to do email marketing. I would start with a newsletter 1-4 times every month with new articles, and news that is RELEVANT to your audience. 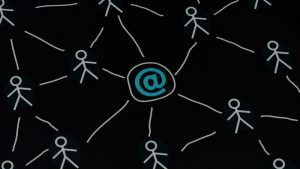 Don’t just use email as a mouthpiece. It’s not a soapbox—it’s a place to build trust. Make sure the content is native and relevant. Meaning… it makes sense to the audience, is solving a need and is something that they ACTUALLY CARE ABOUT. If you need help figuring this out—read the article on building buyer personas and understanding your audience. When you have the right offer that is relevant to your audience, you build trust. You continue to build even more trust with every email you send that is helping them overcome challenges in their lives. This adds real value. When you’ve built trust, you can ask for a sale. Maybe the sale is your $ 10 ebook, or maybe it’s a coaching session. Either way, once you have the attention of your audience, asking for the sale becomes easy. The real kicker though, is that attention must be earned. You can’t demand it, and you can’t fool people. When you’re given the gift of attention—it means you’ve earned trust with your audience through repeatedly giving REAL VALUE that made a difference in their lives. Where should you place the optin offer? 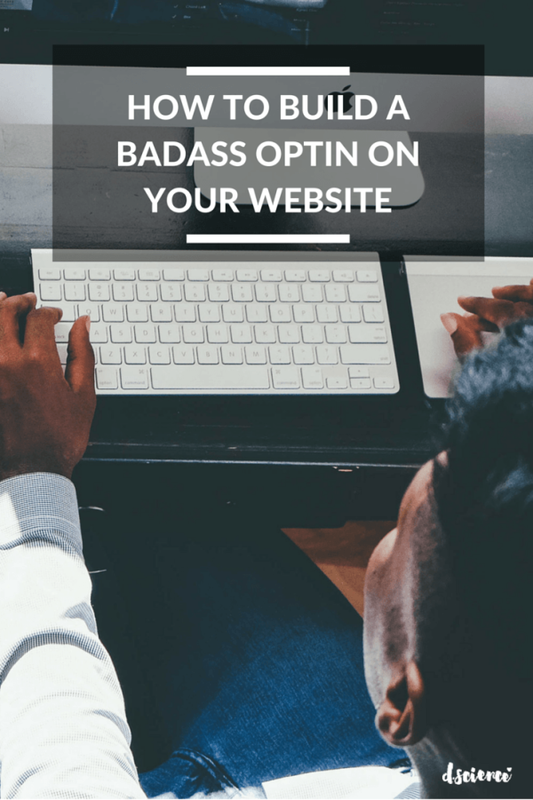 Your optin offer should be on every page of your website. 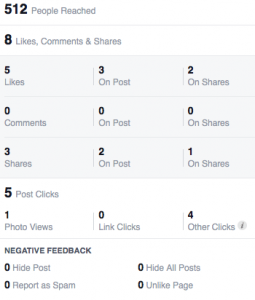 If you have a blog, you never know what page the users are going to hit initially. More often than not—it’s a specific article and not the homepage. This should be above the fold (meaning you can see it without scrolling down the page). There are a variety of ways to take care of this. This is a strip bar at the top of your webpage asking people to optin. It shows up on every page too (nice benefit!) You can get your very own Hello Bar, here. 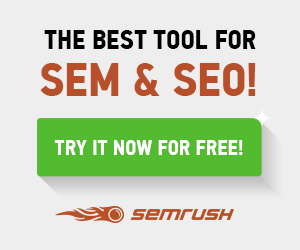 Sumome has a variety of pop up options for your website that you can place in the homepage. Let’s explore more pop up options below! These can be annoying on websites, or they’re just what the user called for. Don’t make them icky looking or pitchy. No one likes that ‘ish. If you can make a simple design with a clear offer and clear benefits to sign up—this is a great way to build your list. This is a timed pop up. 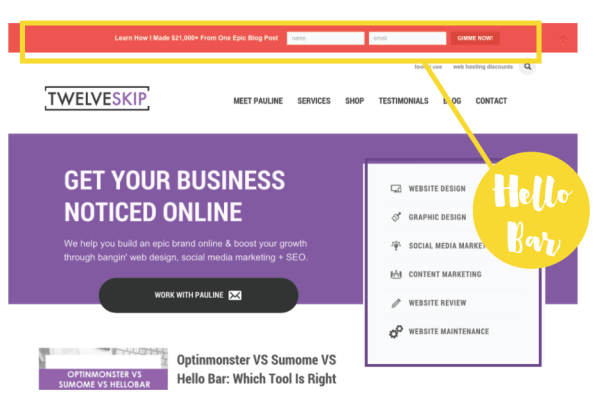 After a user has spent a certain amount of time scrolling through your website, a pop up will show up in the lower right-hand corner. This is more discrete than a normal pop-up, and still builds your list. The sidebar offer isn’t trafficked nearly as much as the others. However, I would still add a sidebar optin for the few people that will join your list because of it. 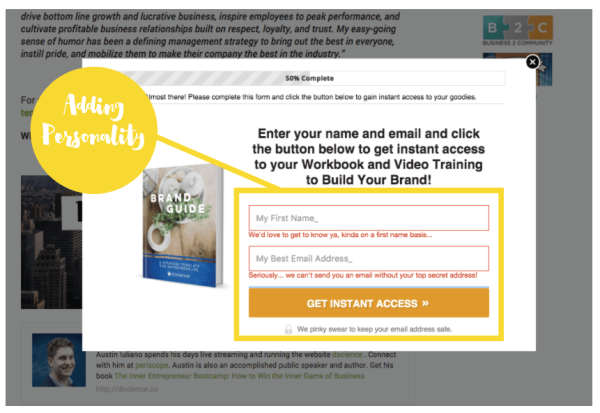 I love just using a Leadbox from Leadpages for the sidebar. When someone clicks on the image, it pops up with a full optin form. Plus you get all the tracking that Leadpages offers in their metrics. These are also known as “content upgrades.” After a user has gone through reading one of your articles, you have their attention. If they enjoyed what they consumed, they have an opportunity to continue being updated and given relevant content. If not—well then, they can leave without a worry. 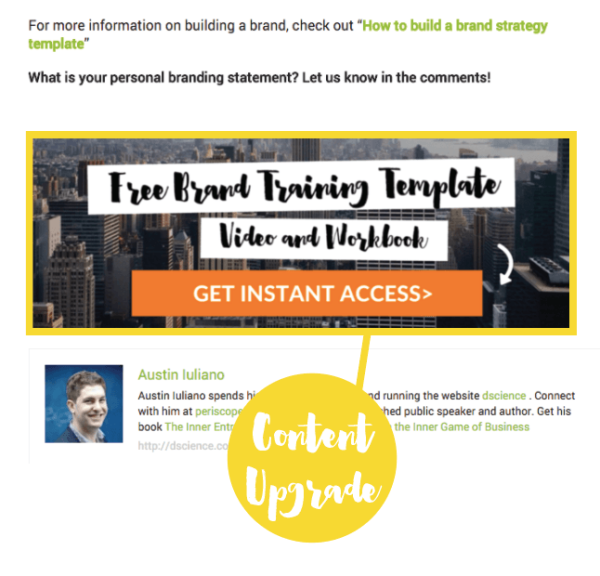 A content upgrade is an offer that is specific to the blog article. 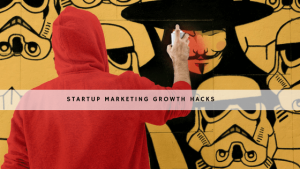 If you have a blog article that’s and introductory piece, you would offer a more intermediate take in an ebook that they can download in exchange for an email address. These offers work incredibly well because the offer is relevant to the content in the article. If they loved the article, and are interested in learning more—you’ve captured their attention! Win-win. These are the highest converting optin offers that we have. 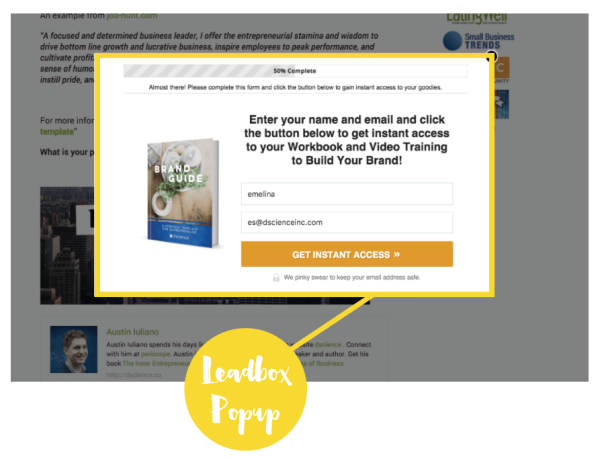 Like in the sidebar, I use Leadboxes from Leadpages. They’re easy to plug the code into the end of the article. How do I Install an Optin? This is usually pretty simple. 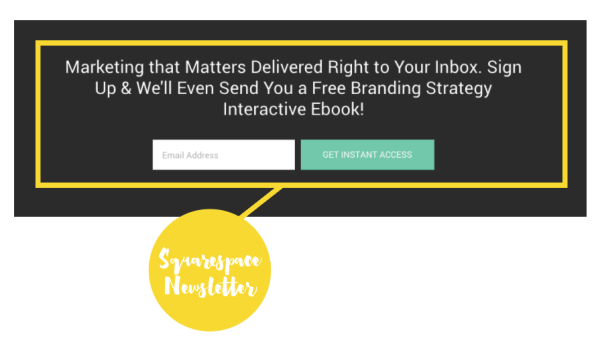 If you have a Squarespace site, it’s as simple as “adding a newsletter” function to your page. If you are using Squarespace, you must use Mailchimp as your email marketing provider. Otherwise you’ll have to get an IFTTT (if this, then that) program like Zapier to convert the information to your actual email provider. Obviously, WordPress is pretty robust. This means there are quite a variety of successful ways to install your optin. If you haven’t built your website yet, and you’re wondering what platform to use—WordPress or Squarespace, read the article here. 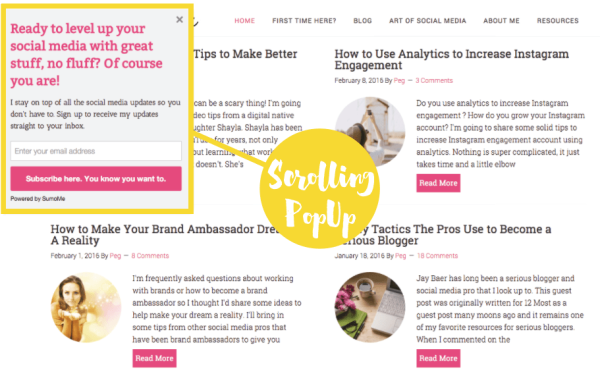 Sumome offers an array of popups, scrolling popups and the like for your website. This can be installed really easily as a plugin in WordPress. It actually works with Squarespace too! I love this program because it’s just so damn easy. You create a graphic, upload it to Leadpages, and then copy the html code that the program gives you to place in your website. Making Your Optin Page Sing with Personality. At any point in your website you have an opportunity to pack a personality punch. This provides a little bit of humor and personality to something that would otherwise be very dry! It allows your audience members to get to know you a little better. After all, people buy from people. 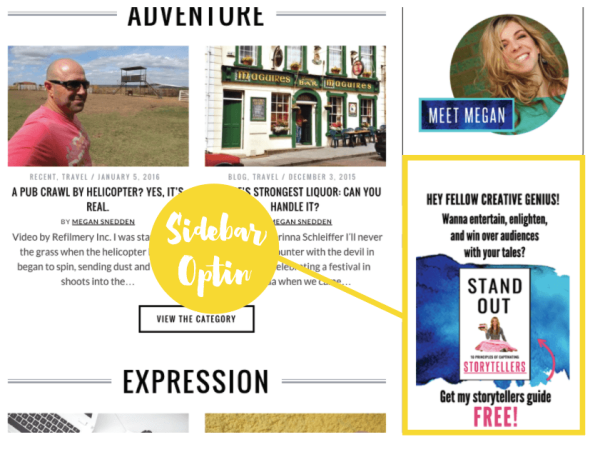 Add personality into your free optin offer by creating an epic headline. Use power words and emotional words to make an impact. You can test your headline at Coschedule’s Headline Analyzer to see if it fits the bill. Please don’t create a button that just says “submit.” Those boring days are long over. Pack a personality punch in the button that will get your viewer pumped up! You could say “I want in!” or “Yes, Please!” or “Sign Me Up, Baby!” The options are endless. When someone types in an email the wrong way, or forgets to enter their first name, you have another opportunity for a touchpoint. I always add some funny little phrases to the error messages to entertain my audience. Just because it’s an optin box doesn’t mean that it shouldn’t be fun! If a user forgets to place their first name in the form, the message usually says something like: “We’d love to get to know ya darling! Kinda on a first name basis…” I’ve found that this alone gets many more first name fields added to our forms than otherwise. It’s kind of like catching someone off guard and reminding them that you’re an awesome human. Those are the killer ways that I build a badass optin offer on my website. Have any other methods or suggestions? Let us know in the comments! Shopping On Instagram. Sort Of.